First impressions count, especially in business. Setting up (or adding) only a few key phone features can make any size business look and sound more professional overnight, while ensuring that customers reach you when they need to. With so many features to choose from, we narrowed down our top 3. With Call Forwarding, you can forward calls to another phone number (including a cell phone or home number) so you never have to worry about missing an important call. You can set up rules, menus, and queues based on your needs. With Call Forwarding, you can also choose to have calls blocked all together, or sent directly to voicemail. An auto attendant acts like a virtual assistant and replaces the need for an actual receptionist or operator. It automatically greets callers and directs them to the right person or department by simply pressing a button. You can customize your auto attendant with a number of options. With Find Me Follow Me, your office doesn’t have to be restricted to your main place of business. This powerful feature allows your employees to receive calls anywhere, anytime and from any device while still connecting all of your employees under one corporate phone system. Calls can be routed to a cell phone, another number (like a home office or hotel room), or another person (like a receptionist or a co-worker). You can even customize how you receive calls by day, time and even caller. example: ring your cell phone first, and then your home office). 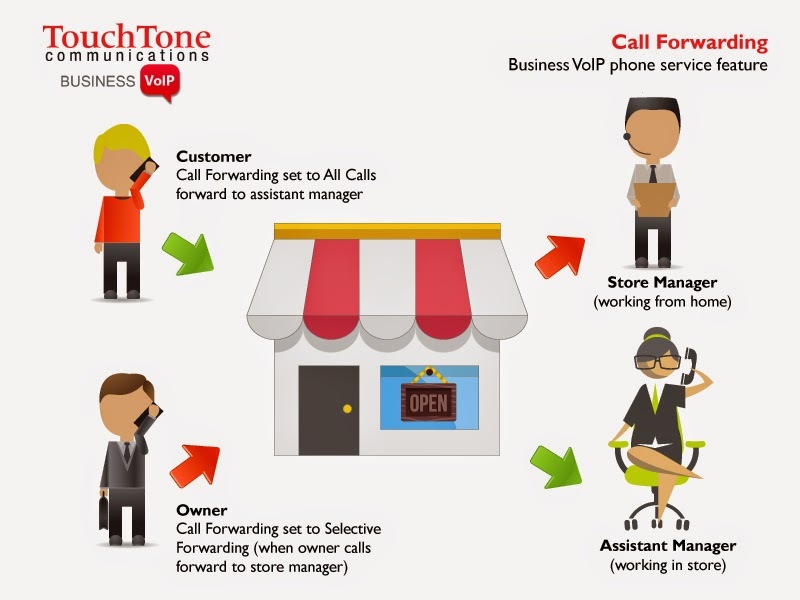 TouchTone Business VoIP phone service arms customers with powerful calling features like these to help them run their business more efficiently.